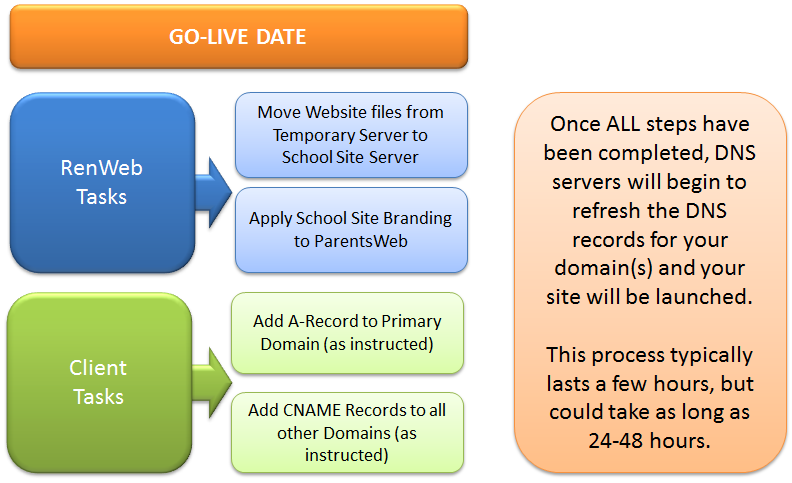 For School Site customers who are ready to move their School Site to their domain. Complete the Go-Live Request Form. Please submit your request at least ten business days before you would like to Go-Live. We will initiate a Cname record for you to add to your domain's DNS records, which verifies your domain. These records time out after 72 hours, so we will wait to initiate until we know you are ready to enter it or have someone on you team enter it. Once the Cname record has been added by your school, reply to our team confirming. We will confirm the record has been adding properly and initiate an SSL certificate so your domain is secure (and operates on https). Once we receive the reply from step 3, we will schedule a Go-Live date and time with your school. This requires the attention of several key individuals in our organization and we must make sure they are available at the time you wish to Go-Live. 1 Hour before your scheduled Go-Live time, we will begin moving your website files from the temporary server (ie., demo.cmstemp.com) to the permanent School Site web servers. We will also be branding your ParentsWeb site. At the scheduled time, your DNS records will need to be updated with an A-record and Cname record provided by our team (after the verification record from step 2 has been confirmed). This will need to be updated by your organization or a representative from your Domain Registrar. Once all of these steps have been completed, DNS servers from around the Internet will begin to refresh the DNS records for your domain(s). As soon as they refresh the DNS records for your domain your site will be launched. This process typically lasts a few hours, but could take up to 24-48 hours. You will log into the School Site CMS after going live by adding "/admin" after your primary domain.